This is part of a five-week series between CBC's Mainstreet and Engage Nova Scotia, which will feature highlights of what Engage Nova Scotia heard when it asked 1,000 Nova Scotians about their attitudes to the province, its challenges and our openness to change. I recently got a chuckle out of a print cartoon that showed a man at the front of a hall asking, "Who wants change?" and every hand in the hall was raised. The next frame showed the same man asking "Who wantsto change?" and nobody's hand was up. It may surprise you that this is actually not the way Nova Scotians see themselves. Our research revealed not only a strong need by us for change, but a strong willingness to change. What we appear to lack is a feeling that, as individuals, we can be a part of the change. Part 1: What's it mean to be "Nova Scotian"? Here's how this breaks down. We commissioned several questions of 1,000 Nova Scotians from all ages and regions of the province. On a scale of one to 10, the answers between seven and 10 generally signalled agreement and the answers between one and four signalled disagreement. 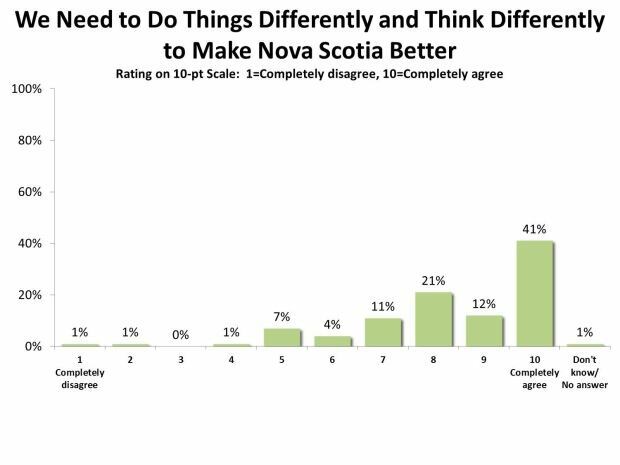 Some 85 per cent of Nova Scotians believe we need to do things differently and think differently to make Nova Scotia better. Almost everyone agreed that a decision to not act puts our future in peril. And they seem to accept that change does not mean losing what we value. For example, 88 per cent of us believe we can grow the economy without losing what makes Nova Scotia special. Against this backdrop, only 47 per cent of Nova Scotians are confident we will be able to successfully address our province's challenges. 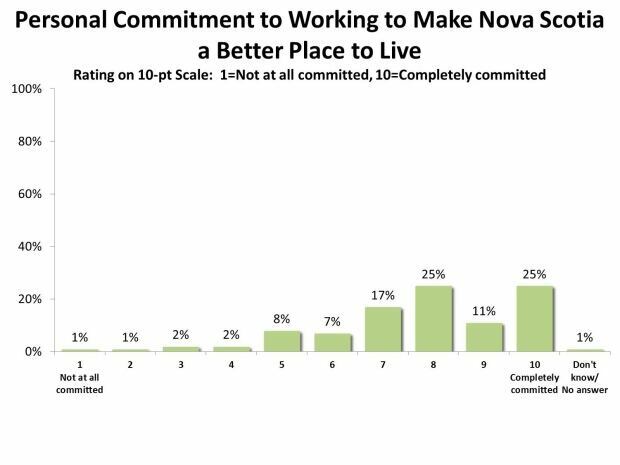 A silver lining is that, despite these doubts, a strong majority of us (78 per cent) are personally committed to working to make Nova Scotia a better place to live. 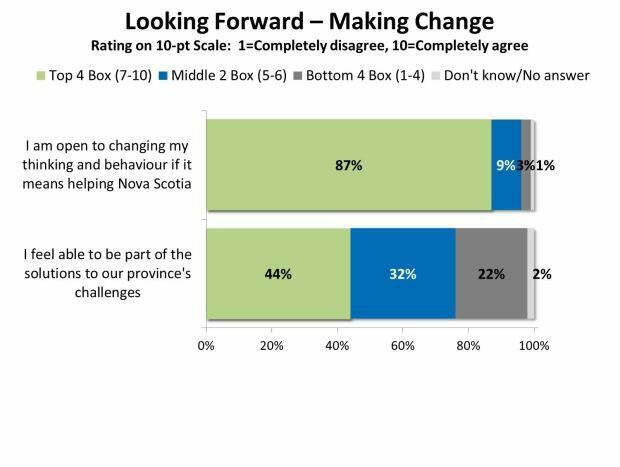 An even higher percentage (87 per cent) are open to changing their thinking and behaviour if it means helping Nova Scotia. What appears to be missing, however, is a belief that everyday citizens can be part of the solutions to our province's challenges (44 per cent). We need to ensure the many who want change, and are open to change, find the opportunities to be part of the solutions. Connecting willingness to ability may be the key. Everyone's idea of change is different. Taking the time to understand what we collectively value, what needs to change and what needs to stay the same is essential to driving our future. expanding on our "oceans advantage"
At Engage Nova Scotia, we have begun to focus on actions that both open new thinking and create new action. On the action side, for example, every fall we coordinate ShareThanksgiving that connects newcomers over Thanksgiving supper to Nova Scotia with families who already call this home. It's a tangible experience that opens our eyes to the benefits our newcomers bring to the province. In two short years Nova Scotians have become Canada's unquestioned leaders in this initiative. It's a small example of connecting the willingness of Nova Scotians to do something with an ability to make a small difference. Many Nova Scotians are doing amazing things and there is no pre-existing road map for this journey we are on. We need to forge new paths, and occasionally retrace our steps, without falling into unconstructive habits of blame and risk-aversion. Only by more clearly knowing our doubts and our aspirations will we get past the succession of traps that have held us back. We hope our research furthers the conversation and leads to new action. What initiatives are you already advancing and what ideas do you have that can help move our gifted province forward? Danny Graham is the chief engagement officer of Engage Nova Scotia, an unaffiliated, province-wide charitable organization that is working to cultivate engagement, catalyze change and support the emergence of a new Nova Scotia narrative. Engage aspires to a future in which we better understand ourselves and our situation; we are more collaborative, inclusive and embracing of change; and where more people are stepping up with greater ability to improve our shared quality of life. This article was originally posted on cbc.ca/news/ on April 25, 2016. Reposted with permission.